NOTES: Get yours before they are gone! Naval aircraft that operate from aircraft carriers have to have several characteristics that one does not find on planes that are land bound. A very strong landing gear to handle the shocks of carrier landings and folding wings for close packed storage are the two major items. In the past years, it has also been pretty much a requirement to have two engines in case one fails and there is nothing around but water. Such is the case with the Navy's current F-18 family of planes. When it was becoming difficult to find parts for the venerable Skyhawk that the Blue Angels were flying, there was really little option aside from the F-18 so in 1986 for the 40th anniversary of the team, they switched over to early block F-18As. All the unnecessary weapons system stuff was removed and the smoke generating system installed stuff. 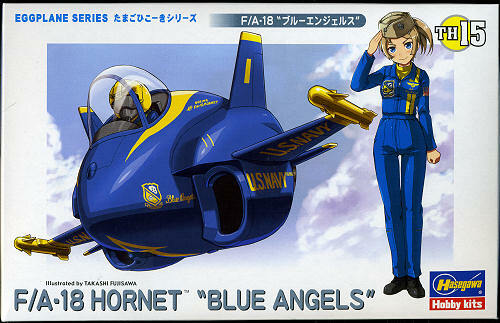 The team is still flying A model F-18s though I'm sure they will eventually switch to C models eventually. One can only wonder what the team will be like if the Navy goes over to UCAVs. Here is another of the Hasegawa egg planes. Like the earlier T-bird preview, this one is not a new mold and has been reissued on several occasions. In common with the others in this series, there are minimal parts, no need for nose weight and a pretty quick build. 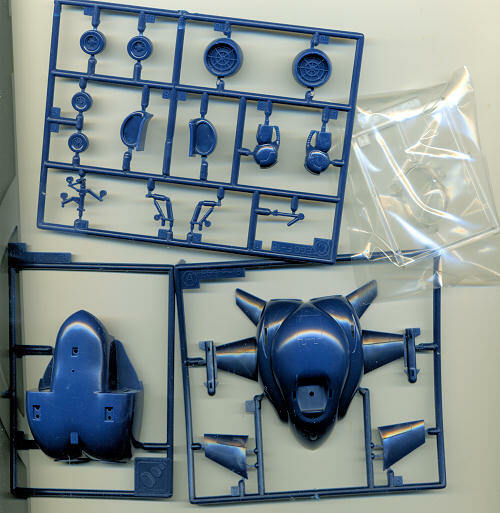 This one totals fewer than 20 parts and is molded in dark blue. The upper 'fuselage' has the wings and tail planes molded in place. The kit comes with missiles though the T-birds fly without them. One will need a bit of plastic strip to fill in the missing section of missile rail. A two part pilot's head and upper torso fits into the cockpit, while the intakes and exhaust are stuck in place once the fuselage is assembled. A one piece canopy, that is very clear, is provided. Instructions are almost unnecessary except to provide for markings and colors. The decals are well printed and cover seven different aircraft. Of course, there was miscommunications somewhere on these as aircraft #7 is a two seat F-18B, but you are provided with serials to match the tail number. 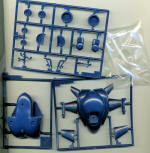 The decals do include an instrument panel and the T-birds markings for the helmet. So there you have it. Another interesting kit that will bring a smile to many faces. Perfect for the young or young at heart and definitely something that those who are obsessed with accuracy will not be building! This is one of four flight demonstration boxings that Hasegawa has released so if you are into those sorts of things, you might want to pick up one or more of these. Thanks to me for grabbing this one from a quickly dwindling pile at the LHS.